For some rats, running on wheels is intrinsically fun. Or a rat under stress might run as a kind of escape. And, yet, I have heard many people report that for domestic pet rats, babies, and maybe adults, need to see other rats running on the wheel to figure it out and go for it. I have had rats who ran on wheels, some for fun, one from stress, and some who stare blankly at a wheel, or at a rat running on a wheel, with “Huh?” on their faces. For the stress factor, when I first got Lila (“Lie-lah”), she was very shy, and at times when I approached the cage she would practically leap to the wheel and begin to run. When I left, she would hop off. This had a strong feel of “I'm a little afraid of you so going to get away now”. Over time I made sure to give Lila treats whenever I appeared at the cage, and eventually she stopped her stress-wheeling. She did love to run on it at night, for the joy of running. Two very different types of running. Along the lines of “Wheels Are Fun” the research-based videos below are astonishing because they shows that a wheel left out in nature attracts all kinds of critters, including mice and rats who choose to run on it! 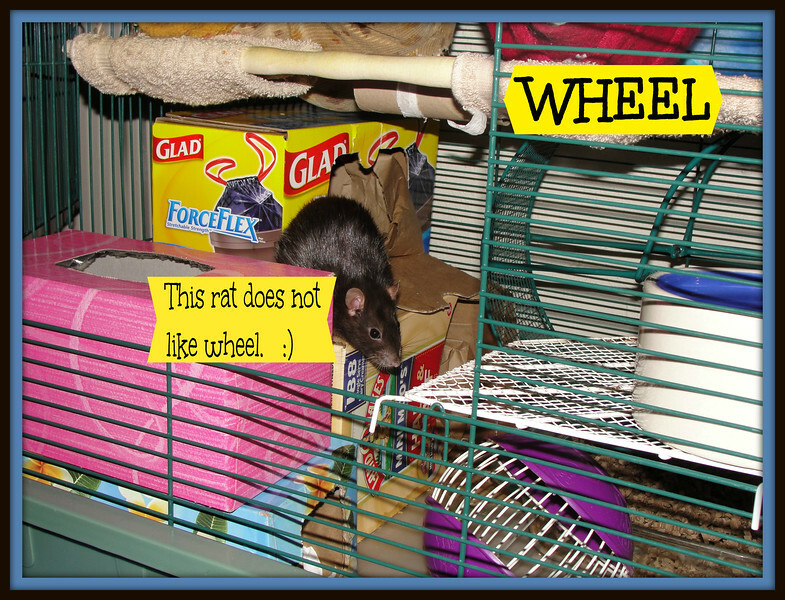 For those of us who wonder, why why why would a rat run on a wheel? For exercise? Well, for some rats, like the mouse, frog, and slug in the three videos, running is just plain fun. From an article on ScienceNews about the research, “Over a period of three years, the researchers collected more than 200,000 recordings at the two sites and analyzed more than 12,000 video fragments. Those videos captured not only mice running on the wheels but also rats, shrews and frogs, and even slugs slowly moving along. “The researchers could see that some of the wheel movement was unintentional. But other times, the animals would stop running, get off the wheel, then get back on and run some more. That indicated that running was probably an intentional activity. “Mice mostly ran for a minute or less, but a fifth of the time, they ran for longer. One even stayed on the wheel for 18 minutes”. AMAZING!!! For more, read the article on Science News, “Mice really do like to run in wheels”. You can also access the full free research article by Johanna H. Meijer and Yuri Robbers, Laboratory for Neurophysiology, Department of Molecular Cell Biology, Leiden University Medical Centre, The Netherlands, “Wheel running in the wild”, Proceedings of the Royal Society B, Biological Sciences, 7 July 2014 vol. 281 no. 1786. The three videos below are supplementary material to the above article. This is a mouse running. The researchers did film rats running the wheel and I sure wish a video was available. Mousie having fun! It's - a SLUG? Yes, really, it's a slug! A frog. Frog? FROG! HOPPING to make the wheel spin. This isn't from the research but I just had to bring a rat running on a wheel into this gallery! Reasons why rats run on wheels, or don't! There's a dark green wheel in the back on the right side. And a black berkie rat who doesn't like it making her viewpoint known.